When the pair return to Czechoslovakia, the nation of Rudi's birth, in 1948 they find themselves in the midst of a nation in turmoil. The nation has just elected a communist government and fear and suspicion permeate every corner of society. The Great Sebastians are entertainers, not politicians, and inadvertently find themselves embroiled in the intrigues of General Zandek, who believes that their mind reading may be more than just an act. When lives are on the line, and friends turn into foes, can the Great Sebastians use their wits to escape the net of circumstance they find themselves in? Scott Bray (Security Soldier/Novotny) grew up in Los Angeles in the shadow of the motion picture industry. He studied linguistics for 2 years at Cal State Fullerton before giving up on the LA rat race and moving to Yosemite National Park to work for the concession. Scott currently resides in San Francisco and is a member of the Street School Artist Collective. Earle Carlson (Corporal Salda/Mr Balzar) is a native of New Orleans, but is a longtime Bay Area resident who moved here in 1989. Earle first became interested in acting during his undergraduate study at UC Santa Barbara. Then, after an acting hiatus, which involved travel to far-off places and completion of a Master of International Affairs, Earle began a more professional and rigorous theatre training at Studio ACT in San Francisco. This is Earle’s first performance with Actors Ensemble, and he hopes to contribute to many more performances in the future. Gary Dailey (Josef/Comrade Bacilek) is making his first appearance with Actors Ensemble in two roles. Gary’s debut role in the Bay Area was as Mr. Bardolph in the Ross Valley Player’s production of Lettice and Lovage. He has appeared in Equity stock productions including George M with Joel Grey, Unsinkable Molly Brown with Carol Lawrence, and Hello Dolly! with Ann Miller and, later, with Betty Grable. Gary sang for a season with the Lincoln Opera, in Chicago, appearing in their productions of Carman, Die Fledermaus, and The Barber of Seville. In the Chicago area he also appeared in the DuPage Opera Theatre’s production of Madame Butterfly as the Imperial Commissioner. Gary has studied in Chicago, New York, Los Angeles and San Francisco. Monica Garcia (Security Soldier/Colonel Bradacova) was born in Los Angeles, raised in El Paso, moved to San Diego, and finally came to Northern California for school. She graduated from UC Berkeley in 1998. During her childhood she performed in plays, danced, and sang with the school choir. Recently she performed in He Came Seeing as the mother of a blind boy. Monica especially likes improvisation where she gets to be as creative as her characters. Will Green (Sergeant Javorsky) has been on stage with the San Jose Cleveland Ballet in Romeo and Juliet. He adored his multiple roles in the musical Kismet in San Francisco, and this is the second time he has performed at the Live Oak Theatre. He is on summer break from teaching elementary school kids, which he says, “are quite a discriminating audience in their own right.” This fall he plans on beginning to learn that grand instrument, the piano. Hello friends, welcome. Bradford Guthrie (General Zandek) has appeared in two previous Actors Ensemble productions, Inherit the Wind and Road to Mecca. He enjoys being the General because it gives him the opportunity to be the Big Cheese. Andy Hilal (Karel Cerny) lives in Berkeley, works for Epinions, and writes maniahill.com. This is his first theatrical performance since playing Anna’s knickerbockered son in The King and I at age 11. Dan Kurtz (Pavlat) has appeared in Antony and Cleopatra at UC Berkeley, The Tempest with the No Holds Bard company, Twelfth Night, The Threepenny Opera and Dinner at Eight at the San Francisco School of the Arts, Beast on the Moon with Eureka Theater, and The Graft with Barestage Productions, who also performed his short play The Cycle. He is a fourth-year student at UC Berkeley, where he studies Cognitive Science. 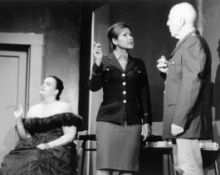 Irina Mikhalevich (Sophie Cerny) began her theatrical escapades as Sophia Zobritzkyin in her high school production of Neil Simon’s Fools, way back in the day. It is only fitting that she should find herself filling the role of yet another Sophie in her Actors Ensemble debut. She is thrilled to be here and hopes here to remain. Renee Miller (Vlasta Habova) is pleased to join Actors Ensemble for the first time in The Great Sebastians. She holds a BA in theatre from Goshen College and has studied at Sichuan Normal University, Actors Theatre of Louisville, ACT, and Bay Area Theatresports. Past roles include Adriana in A Comedy of Errors, Rachel in Reckless, and Bess in the premiere of Hearts and Flowers. Julie Ponsford (Manya/Marie Balzar) has been singing, dancing, and acting since preschool. Her earliest memories onstage involve costumes such as a blue satin tutu and fairy godmother wand ensemble, and her first memory of director’s notes was the order not to shake her hips around so much during her solo. Her favorite roles include Rabbit in Winnie the Pooh, Melody in Psalty II, and Ranger Jones in The Yogi Bear Show at Paramount’s Great America. Most recently, she pouted through the role of Suzanne in an award-winning production of Don’t Dress for Dinner at Chanticleers Theatre in San Leandro. Not long before that, she danced and sang through 105 shows in a yearlong tour with the international organization Up With People and their musical ROADS. One of Oakland’s newest residents, Julie is excited to be a part of the cast tonight. She thanks her fellow cast members “without hesitation!” for the fun it’s been, and her family for always being here. Trish Tillman (Essie Sebastian) is an actor and teacher who has just completed her Masters degree in theater in New York. Favorite roles include Puck in A Midsummer Night’s Dream, Vanya in The Cherry Orchard, and the primatologist Dian Fossey in a one-woman show, The Moon The Way It Shines Up Here. Trish teaches improvisation and acting at the Academy of Art in San Francisco and is on the teaching staff at New Conservatory Theater and Marin Theater Company. You may have heard her voice on CD-ROM games like “Where in the World is Carmen Sandiego”. After years of childrens’ theater, she could also be one of the few who has successfully portrayed both a human lung and Queen Elizabeth (but not in the same show, alas). Thanks to DMG. Dan Wilson (Rudi Sebastian) is appearing in his first production with Actors Ensemble. He has most recently been seen as Prince Rickard in CAFE’s Mapping the Box, as the yogurt schlepping Clancey in Runs with Scissors at The Marsh, and as the dashing Giorgio in Staged Hereafter’s Reverse Thunder. Dan has also appeared in Vallejo, Fremont, and Theatre Yugen in San Francisco. He is the author of the comedy In a Distant Country and directed Twelfth Night for the San Leandro Shakespeare Festival. Dan is delighted to get to act like a raging diva without alienating everyone around him.